Watch Out for the Tree-of-Heaven - clclex's JimdoPage! The Plant Materials Guide for Lexington lists exotic invasive plants as well as plants native to Lexington. 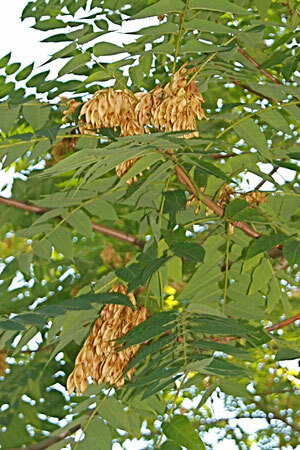 Knowledge about invasive species like the tree-of-heaven (Ailanthus altissima) is important in protecting the native environment. The tree-of-heaven was introduced from China to North America as an ornamental tree in 1748 by a Pennsylvania gardener. These trees became available from nurseries in 1840 and were widely planted in cities. According to the US Department of Agriculture, they currently grow in 42 states in the US. 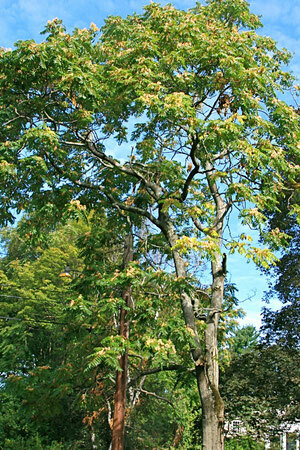 Tree-of-heaven is included in a list of plants that Massachusetts has prohibited for sale, trade, purchase, or distribution. Though trees-of-heaven are attractive, they are highly invasive. They crowd out native plants that are good for the environment and produce toxins that inhibit colonization of other plant species nearby. Trees–of-heaven grow fast and can reach about 80 feet in height. The trees are dioecious—male and female flowers occur on separate plants. The flowers are small and pale yellow to green. Flat-winged reddish fruits, each containing one seed, are produced on female trees in late summer or early fall and persist on the trees in winter. The fruits gradually turn to tan. They are on terminal clusters of the trees’ branches. Trees-of-heaven have compound pinnate leaves—they are structured like a feather with leaflets on both sides of the stem, sometimes with a terminal leaflet at the end. The leaves are 1- 4 feet in length with 10 to 41 leaflets. 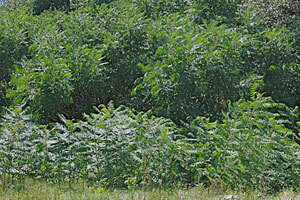 Young sumac shrubs, which are good for the environment, look somewhat similar to young trees-of-heaven. The seeds of trees-of-heaven are dispersed by wind and water. They produce a prolific amount of seeds. One study found that one tree-of heaven could produce more than 300,000 seeds a year. In addition to reproducing by seed, the trees frequently reproduce through vegetative sprouting from roots. The seedlings can grow to 3 – 6 feet in the first year and root sprouts 10 – 14 feet in that time. Trees-of-heaven form dense thickets. The main vulnerability of the tree-of-heaven seems to be its lack of shade tolerance. 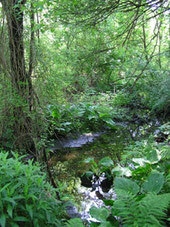 Thus, it thrives at forest edges, in disturbed or harvested forests, in abandoned city lots, along roads, and in meadows. Trees-of-heaven also are not flood tolerant. Chopping down a tree-of-heaven does not get rid of it because it produces large numbers of sprouts from the roots. The root system is extensive and hard to eradicate. However, repeated cutting of sprouts over time may eventually exhaust the plant’s reserves. Chemical methods of control are most effective. Two fungal pathogens that have been found on dead trees-of-heaven are being investigated as possible biological controls. 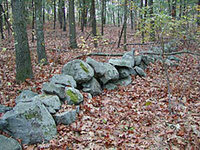 Trees-of-heaven can be found in people’s yards, in conservation lands and other open spaces, and along many roads in this area. Particularly noteworthy are the large numbers of tall trees-of-heaven along Rte. 2 in Arlington, with many smaller ones coming up in front of them reaching for the sun. West Farm, a small Lexington conservation area, has many young trees-of-heaven spreading into the meadow just in front of the older trees. This scenario is found all over. On a family trip to the Great Smoky Mountains National Park in 2010, we drove on federal highways lined thickly with trees-of-heaven, sometimes with long stretches of them at a time, in all the states from Massachusetts to Tennessee. If a seed of a tree-of-heaven floats into your yard and starts growing—which is quite likely given the number of trees-of-heaven around—you should dig it out right away and make sure every piece of root is gone. These trees are extremely invasive and destructive to the environment, as are many alien plants. For those who find trees-of-heaven attractive, 5 species of trees listed in the Native Plant Guide for Lexington have deciduous, compound pinnate leaves similar to those of the tree-of-heaven, but they also provide food and cover for wildlife and have other good attributes. Green ash (Fraxinus pennsylvanica): This dioecious tree grows 30 – 75 feet tall with a trunk diameter up to 20 inches. Its leaves are up to 6 - 9 inches long divided into 5 to 9 leaflets, each about 3 - 4 inches long. The deep-green leaves turn yellow in fall. Both male and female flowers are not conspicuous. The fruiting period is in September and October; the fruits persist through winter. About 10 species of birds eat the seeds from the winged fruits (samaras). This tree is also a larval host to caterpillars of 6 species of butterflies. It grows well in sun, partial shade, and shade and in dry, moist, and wet neutral soil. White ash (Fraxinus americana): This ash has a straight trunk with a conical or round crown of foliage. White ash grows 60 to 100 feet tall with a trunk diameter of 4 feet, considerably larger than green ash trees. The leaves grow up to 12 inches long, usually with 7 leaflets that are 3 - 5 inches long. In the fall, the leaves turn yellow and then purple. This ash is also dioecious, and the male and female flowers are inconspicuous. The fruiting period is in September to November with fruits persisting to early winter. About 8 species of birds, mostly song birds, eat the seeds of the winged fruits. Many are the same as those that eat green ash seeds. This ash also is a larval host for caterpillars of 6 butterflies, some the same as green ash and some different. Both green and white ash trees provide cover and good nesting sites for birds. White ash grows well in sun, partial shade, or shade and in dry or moist acid soil. Butternut (Juglans cinerea): The butternut tree, also called white walnut, reaches 40 – 80 feet tall with a trunk diameter of 1 – 2 feet. The leaves have 11 to 17 leaflets, each 3 - 4 inches long. The leaf size ranges from 15 to 30 inches. The yellow-green leaves turn yellow in fall. This tree is monoecious—the male and female flowers form on the same tree. Neither type of flower is conspicuous. The fruiting period is September to November. The fruits are oblong nuts, 1 to 1½ inches in diameter, that are covered with a sticky husk. About a dozen bird species eat the fruits. Most of them eat the meats of butternuts after they have been opened by squirrels or chipmunks or have split naturally. Butternut trees prefer sun and moist, neutral soil. Mockernut hickory (Carya alba): The mockernut hickory grows 50 - 60 feet or more in height. The bark is rough with shallow ridges, but does not shed like the bark of shagbark hickory. The leaves are 9 – 14 inches long with 7 – 9 (and sometimes 5) leaflets about 6 inches long. The leaves turn bright golden yellow in fall. This tree is monoecious, and both the male flowers (catkins) and female flowers (spikes) are inconspicuous. The fruiting period is September to October, with fruit persisting to December. The round fruits, 1½ inches in diameter, have thick husks that encase the small nuts. Mockernut hickory prefers partial shade and acidic moist soil. Shagbark hickory (Carya ovata): This tree grows 70 - 90 feet or more in height. It has shaggy bark that sheds. 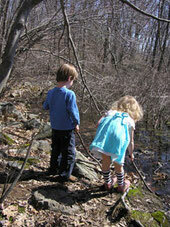 The leaves are 10 - 14 inches long, usually with 5 leaflets, but sometimes 7. In the autumn the leaves turn to yellow or gold. The male and female flowers are similar to those on the mockernut hickory. The fruiting period is September to October, with fruit persisting to December. The fruit, 1½ to 3 inches long, is nearly round and has a thick green husk covering the nut. This tree also provides cover and nesting sites for birds. It grows in sun, partial shade, and shade, and in dry or moist acidic soil. About 20 bird species eat the nutmeats from mockernut and shagbark hickory trees, often after squirrels or other mammals have opened them or they have split naturally. Also, both mockernut and shagbark hickories are larval hosts for caterpillars of several butterflies and moths. Unfortunately, hickory trees have very long tap roots even when they are small so you may not be able to buy them at nurseries. If you know someone with hickory trees, you should be able to transplant them in the first year if you are very careful. Given that periodically oak trees do not produce any acorns, as is the case this year in our area, planting more nut trees certainly would help wildlife when the acorns are not around.